Be a Zero Waste Block Leader! Block Leaders are "green-minded" active neighborhood residents who help spread the word about recycling and composting in their neighborhoods. Most Austinites* can earn a $75 rebate on a chicken coop through the City of Austin Home Composting Rebate Program. To qualify, attend a free chicken keeping class in the community. Then apply! *City of Austin customers who pay the Clean Community Fee on their utility bills and who have not already received a Home Composting Rebate are eligible for the rebate, but anyone may take the class. See the full Terms and Conditions. Austin’s Zero Waste goal creates exciting expansion opportunities for the local recycling and reuse sector. By working in partnership with these local firms, we believe we can make Central Texas into the most vibrant circular economy in the U.S., where every material can be put to its highest and best use within the local economy at each stage of its life cycle. In November 2015, the Austin City Council approved the Construction and Demolition Recycling Ordinance and administrative rules to increase reuse and recycling of materials from construction and demolition projects. To meet reporting requirements, a contractor for an Affected Project must submit an online Construction Recycling Report. This report is due when the Contractor requests a Final Building Inspection. Haulers and facilities receiving the debris can provide the information a contractor needs to complete the report. Austin Resource Recovery does more than pick up trash, recycling and yard trimmings at the curb. We work night and day to keep city streets clean and clear of litter. Throughout the year, we clean residential streets and thoroughfares, clear debris from illegal dump sites and remove dead animals from public rights of way. For more information regarding our organics programs, click on the links below. Austin Resource Recovery provides curbside collection of recycling to single-family households up to four-plexes in Austin. Place mixed paper, plastic, metal and glass directly in your blue recycling cart – no sorting required! Austin Resource Recovery offers a variety of resources and services to certain businesses and commercial properties. For more business recycling information, call 3-1-1 or send us an email. You can help reach our Zero Waste goal to drastically reduce the amount of trash we send to landfills. 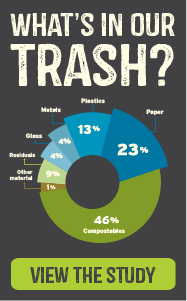 Pledge to do your part to help our community keep at least 75 percent of trash out of landfills by 2020 and reach Austin's long-term Zero Waste goal. Qualifying businesses can earn up to $1,800 in rebates to start, expand or improve recycling, composting or other zero waste programs.